Loyal David Roth: mission worker and deacon in the northern missions of the Alberta-Saskatchewan Mennonite Conference. He was born 18 March 1917 at Tofield, Alberta, and died 14 December 1961 at the University Hospital in Edmonton, Alberta, following open heart surgery. He married Ruth Martin on 12 October 1939. They were the parents of 3 sons and 2 daughters. Loyal and Ruth Roth were pioneer mission workers in northern Alberta. They accepted, or perhaps more accurately, volunteered early in 1948 to move to Culp, Alberta, which at that time had no established Protestant/Evangelical church. 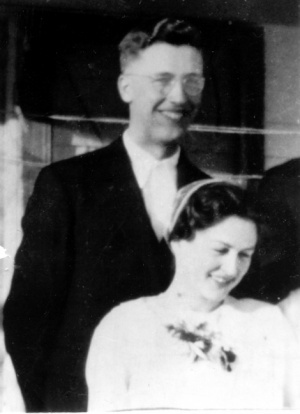 Loyal was ordained 25 May 1952 in his home church, and initially worked together with Rollin and Edna Yoder who established a mission in the nearby small rural community of four Mile Creek which was close to the village of Eaglesham. Loyal Roth was particulary skilled in building relationships with the local people, and came to be highly regarded in the community. He opened a small store which also doubled as a post office, and in 1950 invited other Mennonite northern mission workers for a time of visiting, fellowship, Bible student and devotions. That marked the beginning of what became an annual Northern Workers' Conference. A serious heart disease hampered Loyal and Ruth in their mission work, and they were very grateful when, in 1950, Robert and Pearl Stauffer moved into the community. In addition, Ada Brubaker came from Ontario to provide assistance in the household. At Culp, as in other northern Mennonite mission, the work began with the organization of a Sunday School and Summer or Daily Vacation Bible Schools. There were also worship services, conducted at first in the Roth home. Loyal Roth's declining health, improved road conditions, and other practical considerations resulted in a consolidation of the Culp and Four Mile mission programs in the larger town of Eaglesham. The Roths, in search of a milder climate, moved to a small mission in Montana in 1957, but returned a year later to serve as pastor of the Eaglesham Mennonite Church. Their house/store/post office at Culp was moved to Eaglesham where they served until Loyal's death, at the age of 44, in 1961. Ruth continued her work at Eaglesham until 1963 when she remarried and left the community. Loyal and Ruth Roth were highly respected in the Culp/Four Mile Creek/Eaglsham districts. At the time of Loyal's death a special memorial fund was established to finance the construction of a new church building at Eaglesham. That new building was competed and dedicated in 1965. Regehr, Ted D. "Roth, Loyal David (1917-1961)." Global Anabaptist Mennonite Encyclopedia Online. December 2003. Web. 20 Apr 2019. http://gameo.org/index.php?title=Roth,_Loyal_David_(1917-1961)&oldid=93420. Regehr, Ted D. (December 2003). Roth, Loyal David (1917-1961). Global Anabaptist Mennonite Encyclopedia Online. Retrieved 20 April 2019, from http://gameo.org/index.php?title=Roth,_Loyal_David_(1917-1961)&oldid=93420.